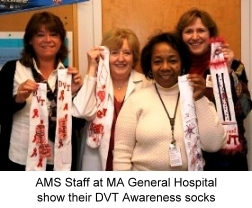 March is Deep Vein Thrombosis Awareness Month! Deep Vein Thrombosis (DVT) Awareness Month is a multi-faceted campaign aimed at raising awareness among consumers, healthcare professionals and policy-makers about DVT and PE blood clots on a national and local level. Click here to learn the history of Deep Vein Thrombosis Awareness Month. Host or Participate in a Walk, Run or Other Event to Raise DVT Awareness: See ClotCare's events calendar for information on DVT awareness events going on in March and beyond. You can help spread awareness of deep vein thrombosis by sending an email to your friends and colleagues. We have created an email form to help you spread the word. Click here to complete the email form to start spreading the word about deep vein thrombosis. We invite you to help spread awareness by posting fliers about Deep Vein Thrombosis (DVT) Awareness Month in your clinics and communities. Please only post these fliers in places where you have permission or authority to do so. The flier includes important facts about DVT and ClotCare's Web address so that interested individuals know where to get more information. Click here to download the flier. Note that the flier is a pdf document. If you have any trouble with the download, please let me know at webmaster@clotcare.org. Click here to download a handout with key facts about deep vein thrombosis and pulmonary embolism. You can certainly post this handout as a flier, but it has both a front and a back, so it can serve as a handout, too. Horizon Vascular Specialists, a group of vascular surgeons in Maryland, also has shared with us a DVT infographic that they put together for their patients. Feel free to download, print, and share this handout, too! Click here to download the DVT risk assessment tool provided by the Coalition to Prevent Deep-Vein Thrombosis. You can complete the DVT risk assessment and share the results with your healthcare provider. Please share the DVT risk assessment tool with your friends and family, too. The Coalition to Prevent Deep-Vein Thrombosis (DVT) is inviting individuals across the country to get active to help prevent deep vein thrombosis (DVT) and pulmonary embolism (PE). DVT Awareness in Motion encourages individuals to stay active even when spending extended time confined to a hospital bed, desk at work, or cramped travel conditions. Click here to download the DVT Awareness in Motion Guide to get instructions on exercises and stretches you can do to help prevent DVT and PE. Click on the links below to view recent Deep-Vein Thrombosis Awareness Public Service Announcements from the Coalition to Prevent DVT. Each video may take a few moments to load. How are you working to promote awareness of DVT in your community? Please share your ideas with us, and we will share them with others. You may send your ideas to Marie Walker at webmaster@clotcare.org.